Acrolinx for Outlook checks your editable content when you're drafting a mail. You can use Acrolinx in both Compact View and Inspector View in Outlook. Acrolinx checks your email body and subject line. If you check an email thread (like when replying to a mail), Acrolinx will check the entire thread, but any cards relating to the previous messages will be inactive. 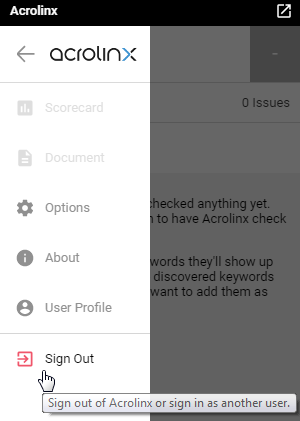 Acrolinx doesn't check items like Meetings, Appointments, and Tasks. How can I install, update or uninstall Acrolinx for Outlook? Acrolinx for Outlook comes with your Acrolinx for Office on Windows package. To show the Sidebar, first start drafting a mail. You can be in either the Inspector View (normally the default when drafting a new mail) or the Compact View (normally the default when replying to or forwarding a mail). The Acrolinx icon will appear in the Message tab in the Ribbon Menu. To use Acrolinx for Office on Windows, you’ll need to enable CORS on your core server. Check out this article on how to Enable Cross-Origin Resource Sharing (CORS) on your Core Server . Acrolinx for Outlook supports server-side content extraction processing. You can define the extraction settings by adding and uploading Content Profiles to your Core Platform. You'll need Acrolinx 5.3 or later to do this. Configure your Content Profiles using the instructions in the section Content Profiles . However, your guidance package also comes with default Content Profiles.